This past spring, Little Miss started going to an official daycare twice a week and she’s really enjoying it. The early childhood educators (ECEs) are great, the facilities are excellent and my child is excited to go there in the morning, but is still happy to come home at the end of the day. There’s a lot of free play available for the kiddos and in Missy Moo’s room there’s both a water table and a sand table. Both of these play areas require all “friends” (the kids) to wear a waterproof smock so that they can minimize they’re level of soaking. It’s pretty normal for my child to be wearing one of her extra pairs of pants or a spare shirt that we have there because she had a lot of fun at the water table. While at daycare, she’s allowed to have Bunny with her if she really wants him in the play area. Otherwise, he will go and have a nappy in her locker (which is a large cubbyhole and spot to hang her coat). When the morning drop-off happens, Missy Moo tells me that “Nummy is tired, but Bunny is awake!” That means her pacifier, which is attached to bunny with a clip is going to go into her locker, but Bunny is coming with her when she goes off to play. She usually makes a beeline for the water table. By now, it’s merely routine to put on a smock for herself. 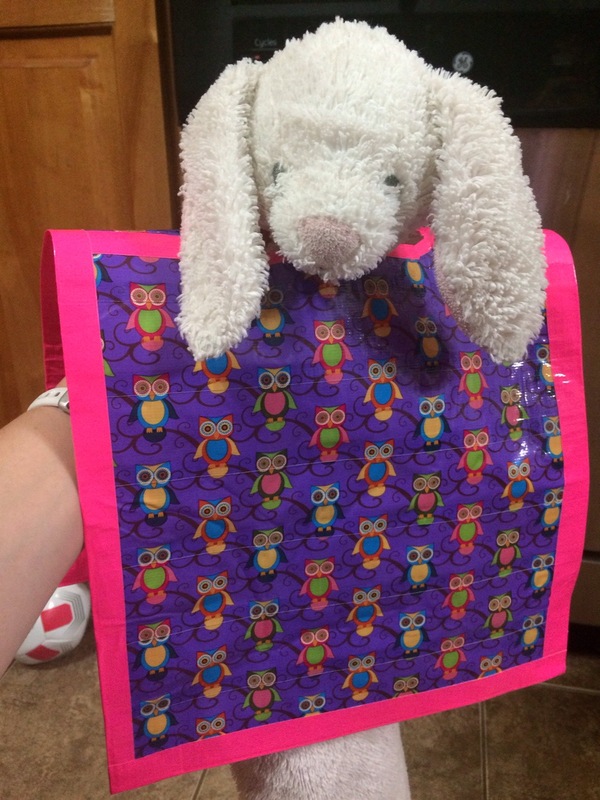 But lately, she has decided that Bunny needs to wear a smock too since it’s a firm rule that all friends at the water table are suppose to wear one if they wat to play at that station. I realize I’m bias, but it’s the cutest thing ever to see her put this giant smock on Bunny. And from what I’ve been told, I don’t think they’ve seen another child pull this stunt. Ha! 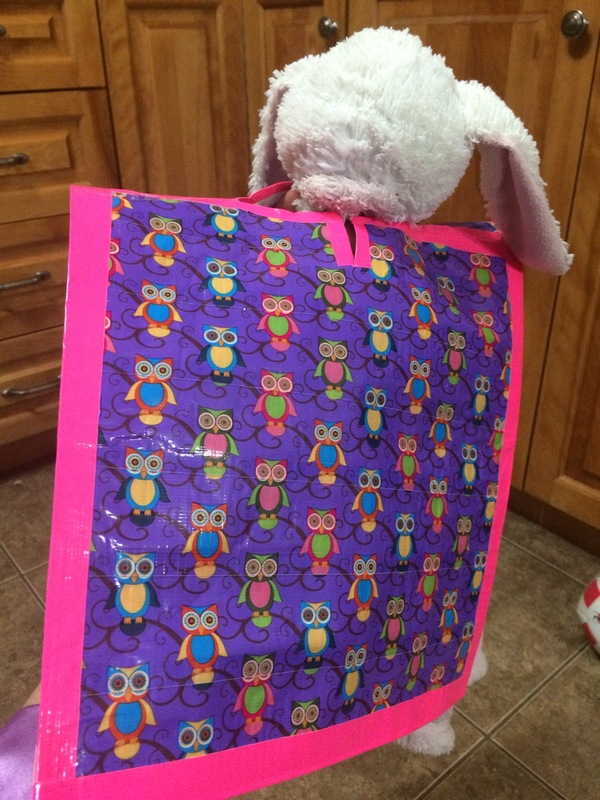 On Tuesday, one of the ECEs joked that if they had a smock that would fit Bunny, they’d let him wear it since the big one doesn’t really work well. I told her I would make a smock and bring it in soon. My parents gave me a Duct Tape kit for my birthday last year and I’ve recently started doing some interesting things with the different patterns and colours. I deciced it was best to try and replicate something we already have. One simple smock that we have at home is from Crayola. Pretty simple in concept right? 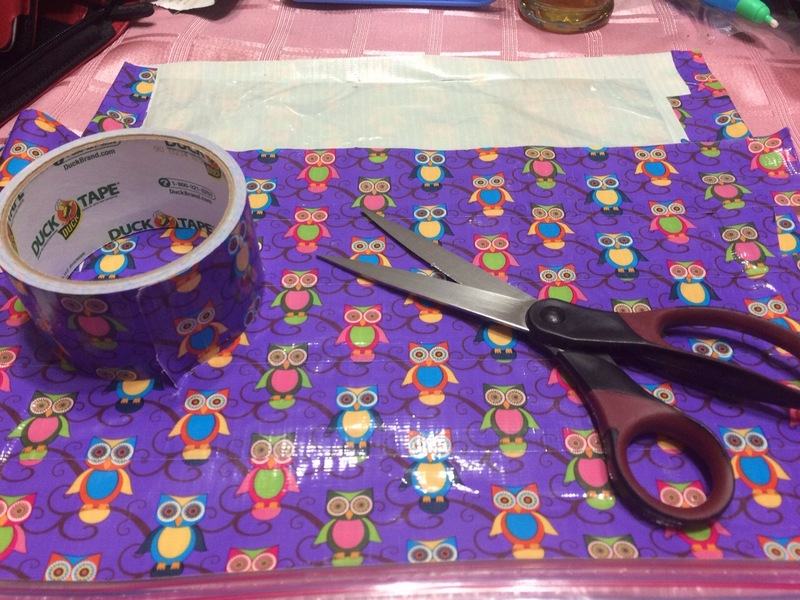 So I took a large Ziplock bag and covered it with Duct Tape on both sides. After covering the “front” and “back” sections, I cut a hold in the top and made a few other incisions and I chopped off the zipper part at the bottom. 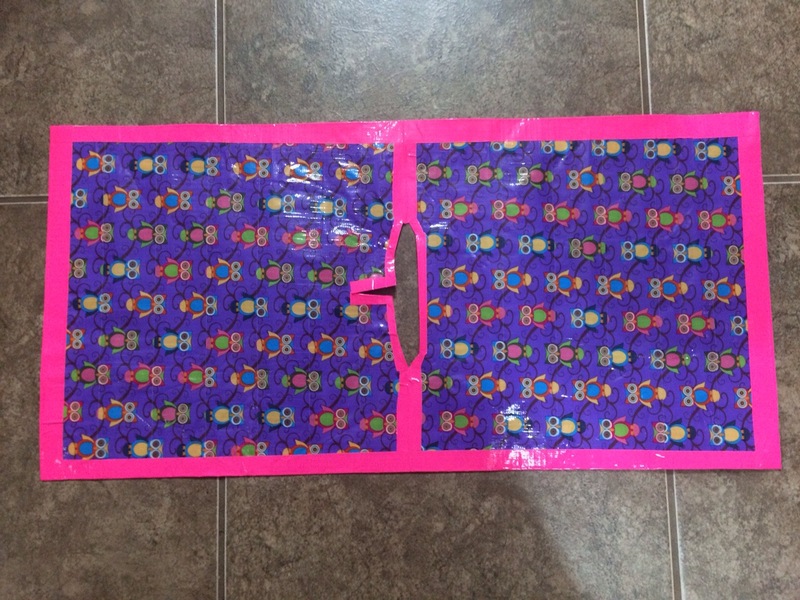 Then I used plain neon pink Duct Tape to give it a border. Ta da! I think it fits rather well. Not gonna lie… I enjoyed my dive into arts and crafts tonight. Can’t wait for little miss to see it tomorrow.